Stationery is something you can never have too much of. There are so many occasions in which you would need stationery. Then there is the decision of choosing between beautiful or simple, embellished or personalized. The possibilities are endless! I love stationery made with a superior paper quality, that comes with matching envelopes and personalized to my taste. This is not something you can find in any old store, but in a stationery speciality shop. And, I know the days of writing letters to friends and family is not as popular with the ease and access to computers and the Internet. But, to be honest, nothing is as personal to me as when I get a letter or a card in the mail. It tells me that someone really cares and took the time to show me that. I am always on the lookout for note cards, especially thank you cards. With having Mason, I have have written more thank you cards for gifts and birthday presents than I have written in a long time. I know that as Mason gets older, we will continue to instill the importance of writing thank you notes. You can never have too much stationery! The Thank You Cards Shop is just what you need to find great quality stationery. They have "Thank you cards for every occasion". For all of your stationery needs, they offer just about any type of stationery card from Wedding, to Baby Shower, to Photo Cards and everything in between. The designs are absolutely adorable and many are customizable! I had the opportunity to review some folded cards with envelopes from the Thank You Cards Shop. There were so many nice designs that I had a difficult time picking a set to review. I chose the Elephant Family Thank You's, Fox Kids Thank You's, and Moroccan Thank You Cards. I was sent beautiful sets of folded thank you note cards with matching envelopes to review. These cards are charming. They are perfect for sending a thank you to someone or a thinking of you note out of the blue to someone you have lost touch with. The packaging was really nice too. Even more impressive was the high quality of the paper, envelopes, and graphics. All of the cards are digitally printed on high quality white cardstock and professionally printed and packaged in their studio. You will find designs to meet all of your needs. More recently, many of the Thank You Cards Shop collection features a lot of cheerful, travel-inspired designs, including a modern twist on the classic airmail card. The environment and ethical working conditions are important to us so we have chosen a supplier whose paper is manufactured in the United States, either from FSC certified forests (ensuring responsible harvesting techniques are used) or from paper that is recycled from cotton remnants. 90% of our packaging materials are made from recycled paper. On top of the beautiful designs and high quality paper, you have an eco-friendly way to send greetings to people you know. I know that I will enjoy using these note cards. Stationery sets also make fabulous gifts for anyone who enjoys hand writing notes and letters. They make great stocking stuffers and are great as holiday thank you's. Check out the Thank You Cards Shop online and see their entire selection of stationery. I know you will love their stationary as much as I did. Plus, now the Thank You Cards Shop is offering our readers an exclusive 50% off discount! Use coupon code mamacheaps at checkout! Hurry, it is only valid through December 12, 2011. Finally, our Elf from the North Pole has arrived! Mason was so excited, until I explained that he had to be good or the Elf would tell Santa if he was naughty! Mason still wanted to play with Elf and kept looking to see if he moved to a new spot. Here is where Mason found him today! If you have been following along, you know that I used to be a music teacher before I started my new adventure of Motherhood. I still love music and have tried to instill music in Mason from the very beginning. I was so excited to find out that I would be getting an opportunity to review the Fisher-Price Learn Through Music TouchPad . This awesome TouchPad is an updated version of the original Learn Through Music system. This musical learning system is really perfect for the pre-schooler who is ready for more advanced toys, like iPad products. However, unlike some of the other iPad products, the Learn Through Music system is a toy that your child can successfully navigate with minimal, if any, help. The Learn Through Music TouchPad offers a large screen for little fingers to easily use. The touch sensitive screen not only lights up, but has different "touch points" that your child can interact with. Mason easily figured out how to navigate through the different screens and even returning to a previous screen if he needed. Your child will learn fundamental lessons through rhythm, rhyme, repetition, storytelling, interactive play and music. I love that the TouchPad is, first off, an interactive music-based learning system. Your child will have the opportunity to play educational games, identify patterns, compare & contrast, follow sequences, listen to directions, and sharpen logic and memory skills. There are several learning cartridges of your child's favorite characters like Dora the Explorer: Dora's Lost in Play Park Adventure and Thomas the Train: Thomas And Friends: A Sodor Celebration that will take your child into a whole new world of songs, games, stories and adventures! Overall, I really liked the Learn Through Music TouchPad . And, more importantly, Mason loves it. He was so excited about the toy he couldn't wait to play with it. Before I could even get it out of the box, he was playing with it and was carrying it around the house with him. Mason does not have any touch screen toys yet and this is the first. I was amazed to see how quickly and how easily he took to the toy. No explanations needed on my end. I love that he can play and explore with this toy by himself. I found this to be a very rewarding gaming system for him. The music based play is fun and he did not get frustrated like he does with some of his other interactive toys. Mason especially liked the attached microphone. This allowed him to sing along with the characters in the included learning cartridge . On several occasions, Mason has taken this TouchPad on car rides and to visit family. It was great over the Thanksgiving holiday. Since I always travel with a toy or two to keep Mason happy, this was the perfect and obvious choice for him. I give this TouchPad two thumbs up on portability! Another bonus (for the parents) is that the Learn Through Music TouchPad allows for your child to plug headphones into the TouchPad for quiet play. Your child can enjoy music and sounds without filling your house with noise or disrupting a sleeping sibling. The Learn Through Music TouchPad is a complete on-screen navigation system with a great microphone for sing-along learning, and a jack for headphones. It includes one learning cartridge - Leo and Friends Alphabet Museum , a microphone for sing-along learning and 4 “AA” batteries. It is recommended for ages 2 and up and retails for $54.99. It is no secret that Mason is a HUGH Sesame Street fan..and that may even be an understatement. The Best of Elmo was the very first VHS tape that he watched and loved to settle down to at night before falling asleep. 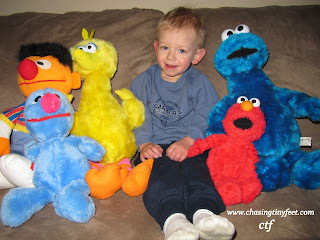 We have dressed up as Elmo for Halloween, celebrated his 2nd birthday ala Elmo style, seen Elmo's Green Thumb, and of course, Mason has his collection of stuffed Sesame Street characters that he calls his "friends". 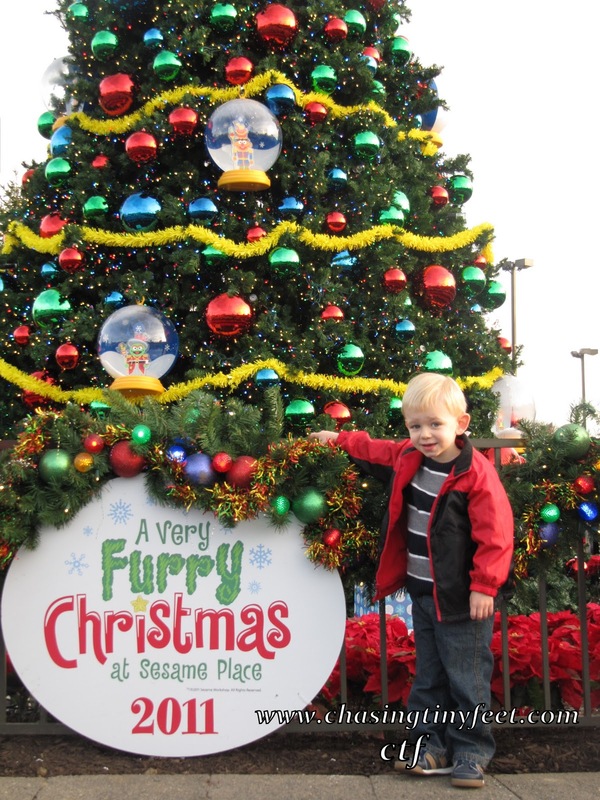 So what a better way to kick off the holiday season than to head to Sesame Place for their new "A Very Furry Christmas" event. A Very Furry Christmas is new to Sesame Place for 2011. This is the perfect family event to get you in the holiday spirit. With parades, Christmas shows, rides, games, music playing throughout the park, the awesome twinkling lights that make the park come alive, and of course, Santa, you will undoubtedly find something for everyone in the family. We started our day off with the Neighborhood Street Party Christmas Parade. What a great parade with all the Sesame Street characters. Dancing and holiday songs like Jingle Bells, Sleigh Ride, Let it Snow and Rudolf the Red Nose Reindeer got everyone up and dancing along the parade route. 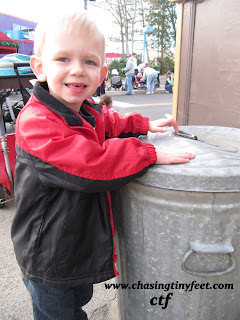 We explored Sesame Street and Mason found his latest obsession, Oscar's Trash Can! After visiting with Oscar we walked around the park and played some games and enjoyed some of the rides. We came across an exhibit of different Christmas bells. 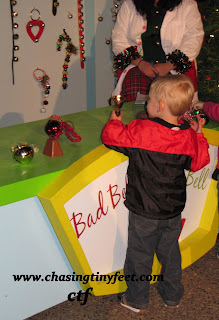 Mason loved playing with the different types of bells and experimenting with the different sounds each one made. He would have stayed here all night if I let him! We ended our night with the 1-2-3 Christmas Tree Show. This was a spectacular light and music show. 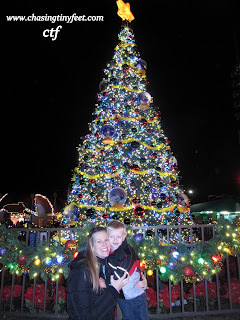 It featured a 25 foot Christmas tree that seemed to dance along with the the holiday music! I think this was one of Mason's favorite activities. 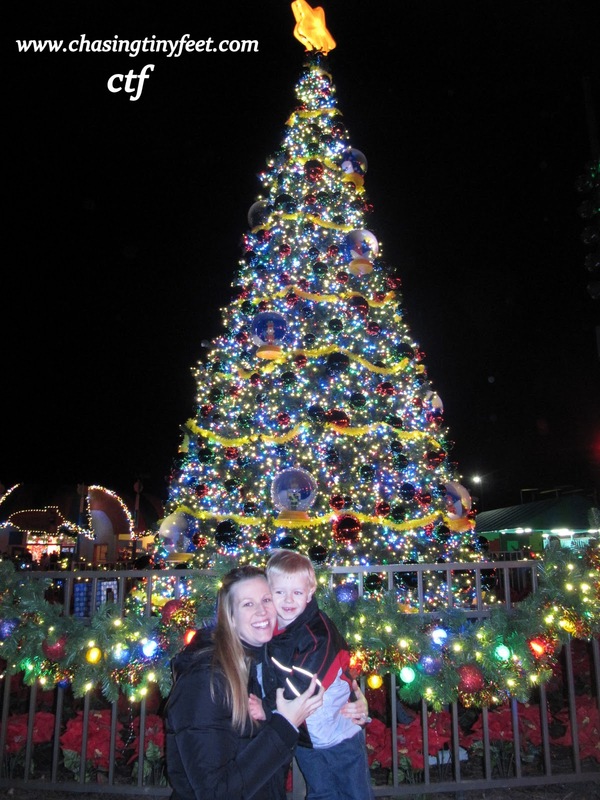 He loved the lights and of course, knew all the Sesame street holiday music. A Very Furry Christmas runs from November 25th through December 23rd. Operating schedule varies, so make sure you check park hours for A Very Furry Christmas dates and hours of operation. Sesame Place kindly provided me with tickets in order to facilitate this review. All opinions are 100% mine.